The front office staff were very friendly and helpful. Dr. Mahadevan was kind and did not make me feel rushed. Weconversed about my history and plan of care. I left feeling confident in his care. The front office staff were very friendly and helpful. Dr. Mahadevan was kind and did not make me feel rushed. We conversed about my history and plan of care. I leftfeeling confident in his care. After reading a lot of reviews, my wife finally picked Dr. Mahadevan and I am so glad she did as hewas one of the most personable doctors I have met in a long while. He was great and I felt very comfortable discussing anything with him. With the very convenient location, I feel like I have found a long-term doctor. After reading a lot of reviews, my wife finally picked Dr. Mahadevan and I am so glad she did as he was one of the most personable doctors I have metin a long while. He was great and I felt very comfortable discussing anything with him. With the very convenient location, I feel like I have found a long-term doctor. Please be aware: Trident Health Center has a policy of NOT refilling pain medications, narcotic medications, or controlled anxiety medications upon your first visit. We also do not do chronic pain management. Lisa Neff, PA is a female physician assistant who is available to see all patients including those who would feel more comfortable seeing a female provider. Arvind Mahadevan, MD Founder & Medical Director of Trident Health Center Diplomate of the American Board of Family Medicine Associate Clinical Professor at Midwestern University – Glendale campus Outside Medical Consultant for the Arizona Medical Board As a physician, Dr. Mahadevan chose the field of family medicine because of his belief in the importance that good health is a long-term objective that results from the partnership between the physician and the patient. He particularly enjoys the opportunity to take care of multiple members of the same family, especially across the generations – true family medicine. He is interested in all aspects of medicine but has special interests are: sports medicine, clotting disorders, diabetes, hypertension, and high cholesterol. 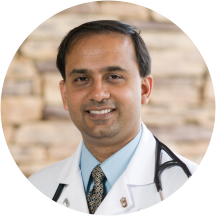 Dr. Mahadevan is an Arizona native who grew up in the East Valley. He graduated from Mountain View High School in Mesa and then obtained his Bachelor’s degree in Biomedical Engineering at Arizona State University. He left the state to pursue his medical education and training before returning to Arizona to begin practice in 2008. Super nice! Very good listener! Very knowledgeable doctor. Gave me sufficient time . Got some real good advice. He was very attentive and I felt he really cared about my issue. Asked a lot of questions and had open discussion before deciding treatment. Exceptional doctor! Very knowledgeable and patient, he answered all my questions. I have been unable to contact the office for almost a week now. Did my annual physical today. I love that they realize how valuable patients time is too. I got my physical done, blood drawn in the same office, shots done, and full allergy test done. All finished in about an hour and good for another year! The office was clean, everyone was very friendly and nice. Dr. Mahadevan was very personable and easy to talk to. Awesome service and professional staff!!! He really knew his stuff and explained it so I could understand. He made me feel at ease throughout my visit (even what would normally be an unpleasant situation...less scary). Thanks Dr. Mahadevan for caring about your patients. I've finally found my primary care Doctor. He is very good and calm in listening to patients concerns and treatment. He was amazing and very informative. I have a follow up appointment and feel no anxiety returning. Dr. Mahadevan was very nice, knowledgeable and articulate in going over my medical history and took the time in explaining the different aspects of my particular health issue and what to expect. This was my first visit as I recently movedto AZ and was searching for a new family doctor/internist. I lucked out in finding Dr. Mahadevan and I highly recommend him. This guy is great! The staff is nice and they get you in right away! I like that Dr Mahadevan took the time to listen about all my problems and is willing to tackle them one at a time. It's hard to find a dr that is attentive and sincere these days. I will definitely recommendhis office to my family and friends. His staff is amazing and friendly as well. Thank you Dr M!! Excellent. Good listener & bedside manner. I've been searching for a new doctor for awhile. I was extremely satisfied with Dr. Mahadevan. He was very professional and took the time to listen to my problems and really seemed to genuinely care. Excellent doctor ... Very nice office staff ... I would highly recommend to anyone! What an amazing physician! Dr. M was extremely thorough and professional the whole time. Absolutely the Dr I have ever had. Dr Mahadevan is thorough and patient ... he listens and cares ... I highly recommend him to anyone. Office staff is extremely efficient. I was seen exactly at my appointment time, no waiting. I had a pleasant visit with my doctor. He responded to all my concerns. Also, I did not feel that he was rushing to see the next patient. Very pleased! I think very highly of Dr. Mahadevan and would like him to know that I am much more comfortable this evening after following his instructions to wear support hose. He is a very knowledgeable Dr. and I am very comfortable withhim. Also like his personality and his sense of humor. He is a very excellent Dr.
Office staff was very helpful in completing new patient steps. Dr. Mahadevan is very professional, thoughtful and helpful. I look forward to working with him as my primary care physician. Great Dr.. Listens and discusses your health concern with you. My visits are ALWAYS very satisfactory. Dr. Mahadevan is in my opinion very pleasant and professional and does not mind giving you extra time with him if needed. I have never had to wait more then ten minutes in the waitingroom. Not very many Doctor's offices can say that. His staff is also very pleasant and they know how to make you comfortable and relaxed. Dr. Mahadevan is the GREATEST Doctor. He is knowledgeable and has the skills to treat a variety of medical concerns. If you are looking for a Doctor that you can trust to treat you and really does care about you, thenDr. Mahadevan should be your choice. On a scale of 1 to 10, he is off the charts! Clarice R.
As always he is knowledgable, courteous and friendly. I had been waiting for him to be accepted by BCBS of AZ Advantage...........well worth the wait! I cannot imagine ever having another PCP!!!!! Robert M.
Doc does what a lot of other doctors don't do -he listens. Has genuine concern for his patients. I absolutely love Dr. Mahadevan and his staff. He spends the right amount of time and listens to your concerns. My questions have never gone unanswered, and he explains everything in detail. The whole staff makes me and my family feel welcomed and truly cared for! Very thorough. Takes his time to listen and to diagnose your illness. His staff is very nice and helpful. I would recommend him to everyone. I left my former physician because he retired. It took me a while to find a doctor I felt had my best interest in mind. I found that with Dr. Mahadevan. Easy to talk to and very thorough. He will spendas much time as needed to address my concerns. The staff is very friendly as well. Dr Mahadevan takes time to listen to his patients. Very friendly staff and nice office. Dr. Mahadevan is very thorough and takes the time you need to listen and discuss the questions and issues you have. He gives you alternatives. I think he is grand and my husband and I intend to stay with him for as long as we can. Dr Mahadevan is a great doctor and listens to what you have to say. He was amazing. Took the time to listen and fully understand My conditions. Was very thorough.